This phone is cheap. Seriously cheap. The Nokia Lumia 530 has a lot going for it, but its main selling point is the price, as it's now been confirmed to start at just £60 in the UK. 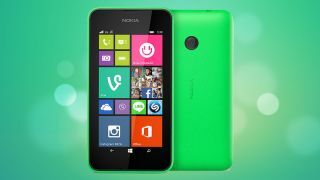 Microsoft revealed that the Lumia 530's release date will be September 4 and that it will be available from EE, Vodafone, O2, Three, Carphone Warehouse and Phones 4u in a range of colours including bright orange, bright green and dark grey. For your £60 you get a Windows Phone 8.1 handset with a 1.2GHz Snapdragon 200 processor, 512MB of RAM, a 4-inch 854 x 480 display and a 5MP camera. On top of that there's 4GB of built in storage along with a microSD card slot which supports cards of up to 128GB and a 1430 mAh battery. So it's a low end phone, particularly when you consider that there's no front-facing camera and the rear snapper has no flash. It's also only a small improvement over the Nokia Lumia 520... but then for £60 you can hardly complain. The Lumia 520 was one of Nokia's most successful Windows Phone handsets and with a price like that we expect the Lumia 530 will repeat the trick. Not just in western markets, but will continue Nokia/Microsoft's positive surge in developing regions too, which is mission critical to the firm as it looks to increase its user base as quickly as possible. The Lumia 730 is likely to launch soon as well.